Everyone has a slightly different approach to business planning and there have been lots of credible articles written on the subject. Over the last few weeks, I have been working on my own business growth plan and I’ve found that 10- or 14-step instructions are far too long for a document that needs to be short, snappy and to the point. I am used to seeing business plans that run to 50-60 pages long, which is a sure sign that they will never be read, let alone actually used to grow the business. Also, an important point for me (and no doubt any investors looking at your plan) is that a business growth plan ties in your delivery plan with the all-important figures. I will follow the ‘Rule of 3’ (see an interesting article about this here – but after you’ve read this blog!) 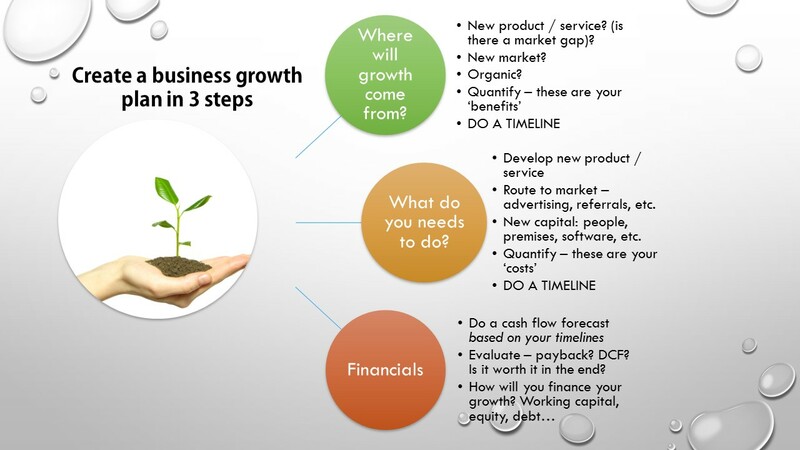 and offer a roadmap to build a business growth plan in 3 steps. Step 1 – Where will the growth come from? If you are a landscape architecture company, do you intend to get the local market to re-design their gardens (market penetration), to offer garden maintenance service or design of roof gardens (product development), to offer your landscaping services to new geographic areas (market development), or are you considering branching out to running a garden centre (diversification)? 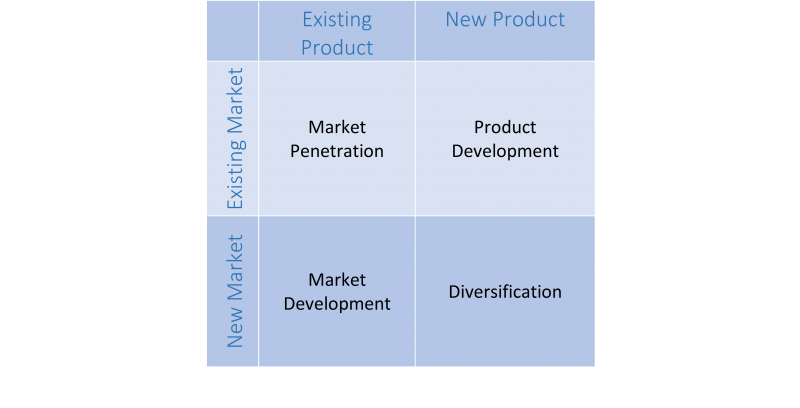 If you are developing a new product or service, is there a current market gap for it? What does the competition look like? Are you entering a crowded marketplace? Once you’ve decided on where your growth will come from, do you wish to grow organically or will you accelerate growth via partnerships / acquisitions? For example, a professional services firm may grow its client base through introducing a referral scheme, by partnering with providers of complementary services (e.g. accountants or independent financial advisors) or by buying an existing practice and its customer base. If you’ve thought about growing your business, you will have thoughts of all these questions and will probably have the answers ready. Step 2 – What do you need to do? Do you need to develop a new product or service? How long will you need? What resources will you need? How will you reach your market? Advertising? Which channels? What about social media? Referrals? Capital – what will you need? Will you need new people? How many? What about new premises? Equipment? Once you are confident that you have a good grip on what you need to do or get, quantify the responses (how much will it cost?) and plot them on a timeline. Your timeline is likely to be a lot busier and more complex than a simple sales timeline. This timeline will become the backbone of your delivery plan and the figures you identified will become the costs of implementation. By doing this first (in some detail), you will ensure that any cost implications are linked to the delivery plan and form a correct cash flow picture. This is the step which many people start with, but to me the financial plan comes second after the delivery plan. Granted, the delivery plan may need to be amended if you discover you are running out of cash! Evaluate the financial merit of your idea. How quickly will the investment be paid back? Do you have a positive net present value? Ultimately – is it worth it financially? Understand the degree and timing of the cash you will need (see my earlier blog on Financing Your Business Growth). Here you will need to think about how you finance your cash needs: working capital? Equity? Debt? If you need to raise finance, be sure to add this to your timeline of ‘things you need to do’. If you struggle with this bit, get a good accountant to help you. By this point you should have a pretty good idea of what you want to achieve, what you need to do to get there and whether it’s worthwhile. Good luck!